Beautifully Updated and Affordable 2 BR/2BA Cottage, A Great Vacation Spot! Perfect affordable vacation for you, a couple, or your family! Newly updated and decorated beach cottage. 2 Bedroom and 2 Baths, sleeps 6. 2 king master suites both with private baths and flat screen TVs. Open concept living area with deck access and enjoyable views. Completely stocked kitchen with all the necessities for your vacation. Stack washer and Dryer. Dining area with seating for 4, additional seating for 2 at the bar. Living room with queen sleeper sofa, 40" flat screen TV, DVD player, recliner and swivel rocker for relaxing. Get some sun and relax on the outdoor deck, or enjoy the private covered patio below with your own grill, swing and picnic table. Quick access to private fishing pier and boat ramp on Little Lagoon available to guests of Gulf Village only. Private pool for guests is just steps away. Two private beach access points for guests only across the street. 50 yards and you're on the sand! Shower and hose available to rinse off. Additional private beach front pool available also! Private, reserved, covered parking for 2 cars no additional charge. Beautifully decorated and very affordable. Low density complex, 200' on the beach, easy access to the lagoon pier for fishing, close to everything in Gulf Shores. Quick access to the beach. More like renting an individual cottage rather than a high rise condo. Less crowds on the beach and at the pool. More affordable and less crowded than high dollar condo buildings. From the deck and living room, limited water view across the street. Living room with sofa sleeper, flat sceen TV, deck access, open concept living area. 3 Total, flat screen, one each in the living room and both bedrooms. Basic plus sports and movie packages. 2, 1 each in 1 bedroom and livingroom. Front balcony porch with chairs. Main level deck with seating for 4, underneath the cottage there is a covered patio with swing, picnic table and additional seating. Shaded. Grill. Yes, pool available for guests only in the cottage section. 1 pool shared by 12 cottages. We thoroughly enjoyed our stay at this property. It was very comfortable and met all of our expect stations. This is a beautiful condo and in such a great location right next to the beach. We were impressed with all the extra little things we found supplied in the condo too. It is really a great place to stay and we will definitely stay here again when we make our next trip to Gulf Shores. We had the best time! The condo was perfect and just as described. Very spacious for 4 adults and right across the street from the beach, we enjoyed having our coffee on the front porch and looking at the ocean. Make sure to bring extra toilet paper as there is only 1 roll per bathroom. The kitchen was stocked with everything we needed to cook, as we cooked breakfast and a few dinners. We will definitely stay again. Thanks Daniel for your hospitality! The condo was beautiful and in an amazing spot right next to the beach. We had an amazing stay and will definitely stay here again if we’re ever back again! The unit is clean and tastefully decorated. Best yet, it's stocked with nearly everything you need. The property is quiet and across the street from the beach. The walk isn't bad at all -- we did it numerous times a day with two kids. The host is very kind and responsive. We would like to stay here again. We so enjoyed staying at this property. In fact, some of our party who stayed next door at Crystal Towers we amazed at our condo and how theirs was so cramped. The owner was such a help and very accommodating. Don't miss out by staying here. Thank You and your Family. I really appreciate your response to my place. Please return or send a friend. 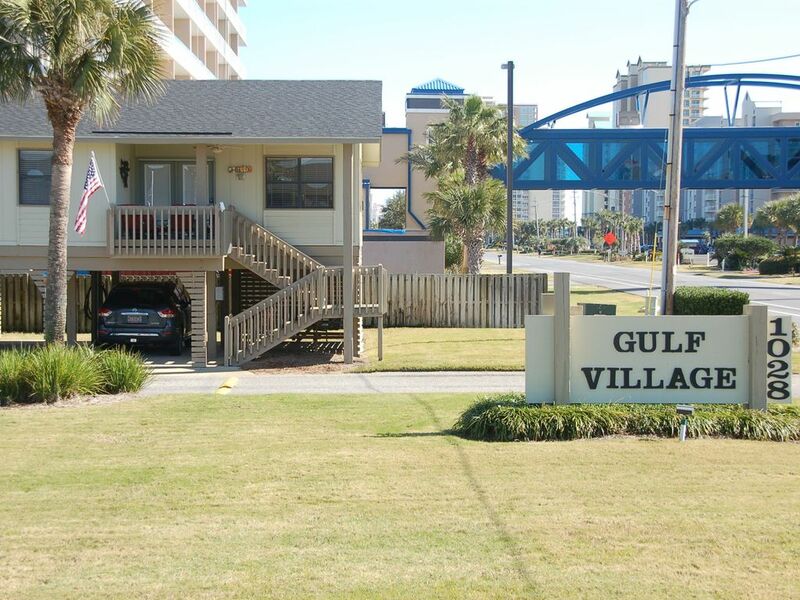 Conveniently located in the heart of Gulf Shores, Gulf Village #3 is located across the street from the white sands and the crystal waters of the Gulf of Mexico. Quick walk to the beach via deeded beach access directly across the street from the unit, 50 yds to the sand. Great location for Shrimp Festival, Hangout Music Festival and all the great activities of downtown Gulf Shores. Short drive to Gulf State Park, Gulf State Pier for fishing or a leisurely stroll. Also, easy drive to the Mobile Bay Ferry, USS Alabama Battleship, and historic sites and festivals in Mobile. Easy drive, 1.5 hrs to Biloxi, MS and the casinos or 2.5 hrs to New Orleans, LA.